Have you all noticed how popular coconut oil has become? Everywhere I look I see recipes with it and articles talking about the health benefits. I confess that I'm not the biggest fan of coconut flavor and I mostly just like it in my pina coladas. Still, this merited some research. Interestingly, what I've learned is that although coconut oil is a saturated fat, it is actually cholesterol free. Good health aside, what I do know for sure is that baking with coconut oil can be very delicious. Especially when you make apple pie bread with it. And nobody is suggesting you eat the whole loaf by yourself in one sitting. Trust me, I'd love to find someone who would suggest that to me but no luck so far. Since it was my first time experimenting with this oil, I consulted with some baking friends and a did bit of trial and error in my kitchen so I could offer you a couple of tips. Consider how much of the coconut flavor your recipe can handle. 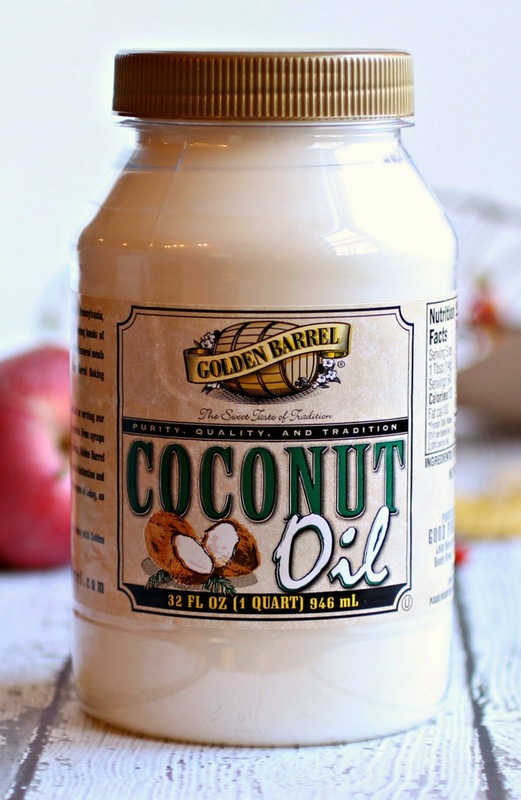 Virgin oils can have a strong coconut flavor that you will detect in your final baked products. But the refined oils are much milder. 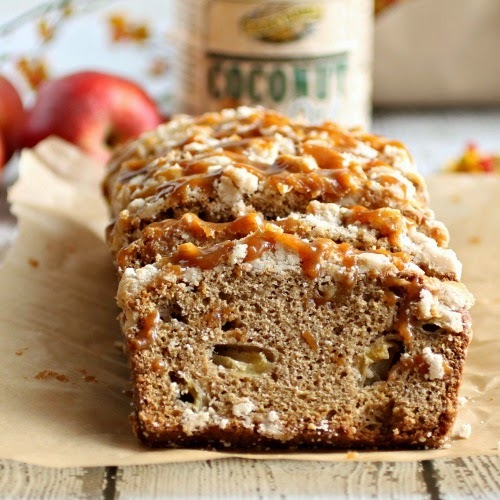 I had the opportunity to work with a refined coconut oil from Golden Barrel and did not notice any coconut flavor in the baked apple bread. As for ratios, you can use the same amount of coconut oil as butter, by weight. For example, my recipe normally calls for 1 stick of butter which would be 4 oz. Therefore, I used 4 oz. of coconut oil. Also good to note is that butter is actually 80% fat and 20% water whereas coconut oil is 100% fat. Nothing terrible would happen if you used it like that but it might make the bread a little too soft. I switched out a bit of oil for water and was very pleased with the texture of the bread. But far more important than the geeky kitchen science is the taste of this bread. 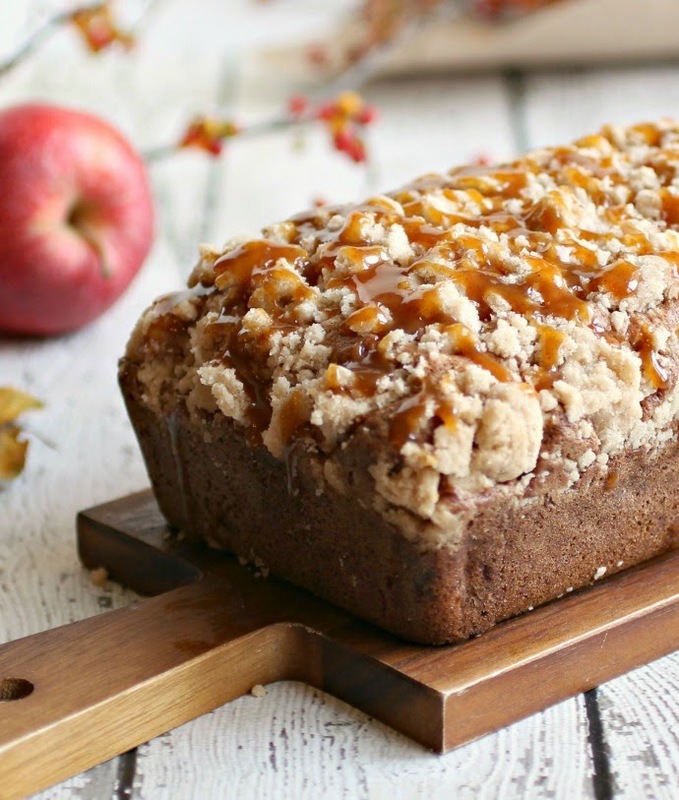 Moist but firm texture, perfumed with apples and spices, topped with a lot of crumb (because I'm all about the crumb) and drizzled with cinnamon caramel because...caramel! So ridiculously good for breakfast, an afternoon snack with a cup of tea, dessert after dinner. Not that I'm suggesting you do all those in the same day. Nope, not suggesting that at all. Not me. Enjoy! Add the eggs and sugar to a large mixing bowl and beat together using a stand or hand mixer. Beat in the coconut oil, water, buttermilk and vanilla until everything is well mixed. In a separate bowl, sift together the flour, baking soda, baking powder, cinnamon and salt. Slowly mix the dry ingredients into the wet and then fold in the apples. Butter and flour a loaf pan (I also placed a sheet of parchment paper in there for easy removal) and pour in the batter. Make the crumb topping by combing the flour, sugar, cinnamon and salt in a bowl. Pour in the melted butter, mix and allow to stand for 5 minutes. With your hands, clump the mixture and crumble it onto the batter in the pan. Bake in a pre-heated 350 degree oven for 55 - 60 minutes or until a cake tester comes out clean. To make the sauce, melt the sugar in a pot over a low to medium flame. Do not stir. When the sugar has completely dissolved, remove it from the heat and add the heavy cream. The mixture will bubble up. Return to a low flame and stir until any lumps are gone. Stir in the butter, cinnamon and salt to taste. 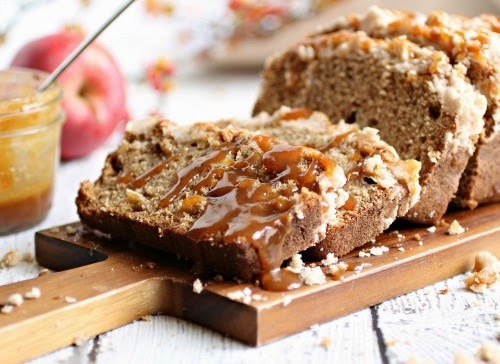 Serve the apple bread drizzled with the warm caramel. Makes approximately 10 servings. Check out the Golden Barrel web site for other cooking and baking products, oils and mixes. I was compensated for creating this recipe but my opinions are my own. Thank you for supporting the brands I love and use in my kitchen. I too have noticed an increase in the use of coconut oil. 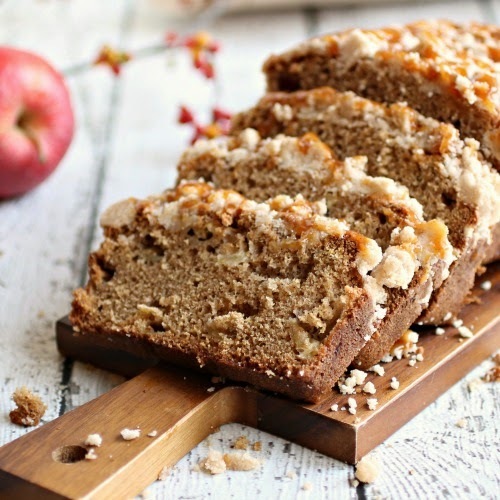 Although, I still am yet to jump on the bandwagon - thanks for drawing my attention to the product, I definitely need to get my hands on some to bake with and find out what all the fuss is about! So pretty!! And amen on coconut oil!